There are certain foods I only eat when my Main Taste Tester isn’t around, either because he doesn’t like them, or because he rarely considers a meal without meat to be an actual meal. This grouping for me includes falafel, vegetarian salads, appetizers disguised as dinner, veggie burgers, and cheese pizza. Cheese pizza is one of my all-time favorite foods. It’s almost always my first choice when it comes to pizza, although I rarely get it because no one else seems to share my sentiment. Apparently most people think cheese pizza is “boring” but I’m with Kevin McCallister on this one. I’d totally have fought Buzz too if he ate my last slice of plain cheese. When boy’s wing night rolled around this week, I pondered on what to make myself for supper and I was reminded of a recipe I’ve wanted to try for a while. I took a basic flatbread dough, slathered it in garlic and pesto and covered it with every cheese I could find in the refrigerator. 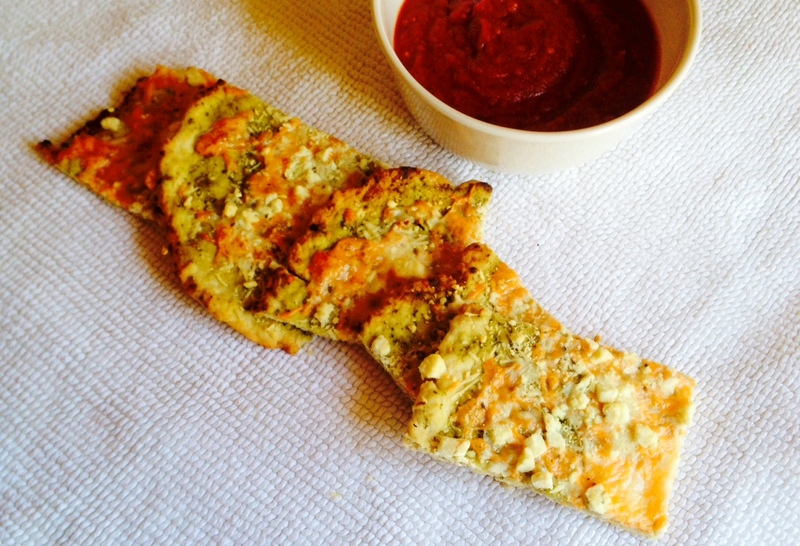 This crust is very thin, crispy and flaky; it isn’t chewy like a more traditional pizza crust. It’s super easy to throw together on those nights that you don’t have time for pizza dough to rise and you could top it with just about anything. Serve with your dip of choice on the side and go to town. The best part? I didn’t have to share with anyone and the only thing that might be better than fresh cheese pizza? Cold cheese pizza leftovers. Preheat oven to 450 degrees and line a cookie sheet with parchment. Brush the parchment with olive oil and set aside. Stir together the dry ingredients in a large bowl with a spoon. Add the wet ingredients and stir together to form a rough ball. Knead the dough a few times on a floured surface until it comes together. Roll it out into any shape you like and bake for 10 minutes until crust starts to bubble and get slightly crisp. While the flatbread bakes, stir together garlic, olive oil and pesto in a small bowl. Once flatbread has baked for 10 minutes, remove from oven and brush it with the pesto mixture (I went right to the edges of the crust). Sprinkle with the cheddar, mozzarella , parmesan and feta. Put back into the oven to bake for 10 minutes more or so until cheese is bubbly and golden brown. Remove from the oven and cool for a couple of minutes, then slice. 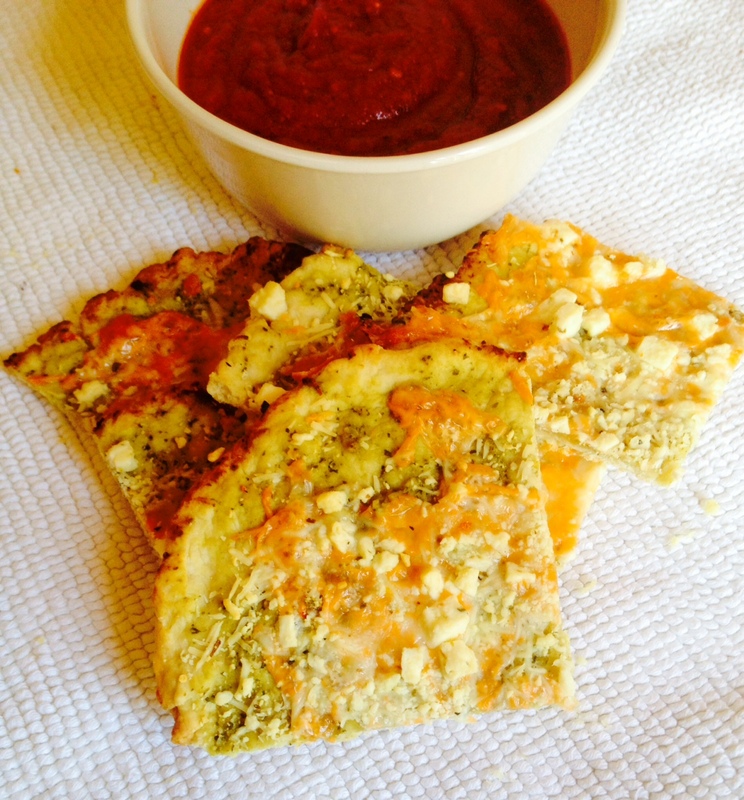 Serve with your favorite marinara sauce for dipping.